After a decade of drafting in the top 10, the Jacksonville Jaguars came within a game of the Super Bowl in 2017. While the team built through the draft by selecting defensive building blocks in Jalen Ramsey, Telvin Smith, Yannick Ngakoue and Myles Jack, their recent free-agent signings are what took “Sacksonville” to the next level. 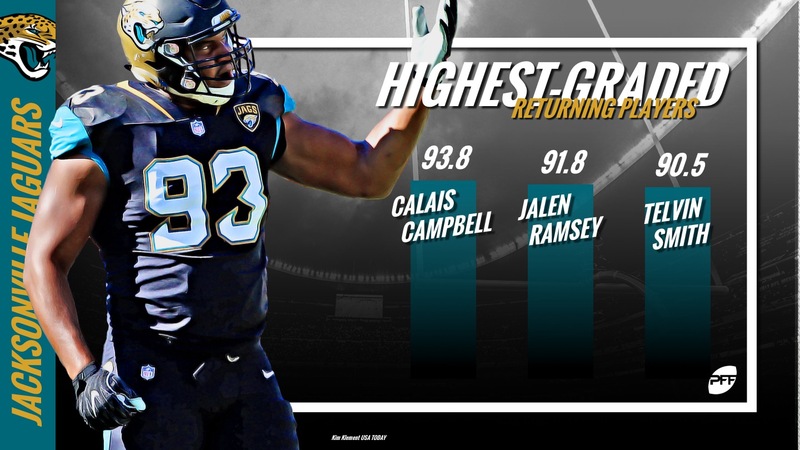 Calais Campbell helped immediately as his overall grade of 93.5 ranked fourth among edge defenders, switching outside as opposed to on the defensive interior where he spent the majority of his time in Arizona. A.J. Bouye formed a dynamic duo with Ramsey and proved his stellar 2016 campaign in Houston wasn’t a flash-in-the-pan. Bouye’s passer rating when targeted of 31.6 was the best mark among all qualifying corners. This offseason’s big-ticket item in Andrew Norwell will go a long way at helping the Jaguars establish the physical rushing attack they’ve been wanting while he is also no slouch in pass protection. Norwell was PFF’s third-highest graded guard in 2017 with an overall grade of 88.8. 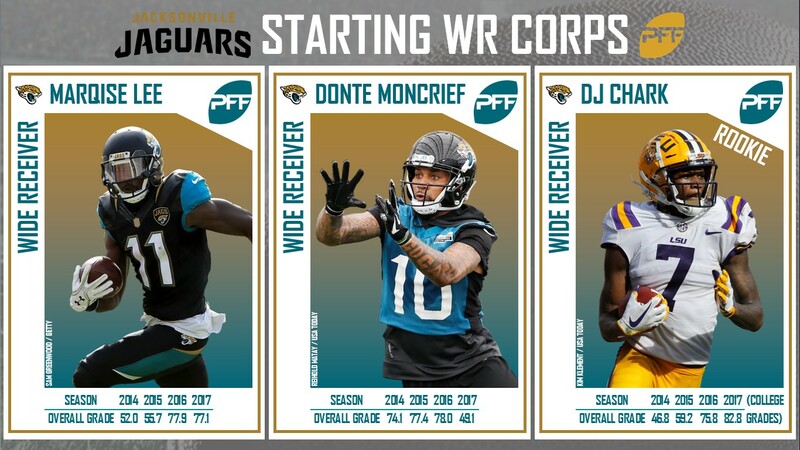 Leonard Fournette will be the focal point of the Jags rushing attack, but the Jacksonville offensive potential ultimately comes down to Blake Bortles. The much-maligned quarterback had an overall grade of 78.3 in 2017 which was 20th at the position but did just enough to win two playoff games this past year. Undoubtedly, questions will continue linger about if he’s the right quarterback for a roster that’s built to win now. With Paul Posluszny retiring this offseason, the Jaguars have 478 snaps at middle linebacker that need to be accounted for. They already have an in-house option that should be up for the task in last year’s fifth-round pick Blair Brown. Brown only played 48 snaps as a rookie, but as a senior at Ohio, he had the fourth-highest graded collegiate season that we have seen from a linebacker, sporting an overall grade of 94.0. In that season alone, Brown had a whopping 47 run stops good for a run-stop percentage of 15.5 percent. He wasn’t just a run stopper either, as he recorded a coverage grade of 87.7. The Jaguars will have to account for losing Aaron Colvin in free agency as well. Colvin, on a per snap basis, was one of the league’s top slot corners last year, and the team signed D.J. Hayden to likely fill the void. The first five years of Hayden’s career have been subpar (his highest season grade to this point is 57.6), but there are signs of encouragement. While his yards allowed per coverage snap hovered around the middle of the pack among qualifying corners, Hayden had career bests in completion percentage allowed (58.0 percent) and passer rating when targeted (76.7) in 2017. The Jaguars have the makings of an AFC contender once again except this time around, they’ll likely be the hunted rather than the hunters. With a already-tough schedule and the possibility of both Andrew Luck and Deshaun Watson returning at quarterback in the division, this year’s road is tougher on paper. Their defense, in part due to their second rated pass-rush, should help counter the gauntlet of quarterbacks but ultimately, their fate likely lies in the right arm of Bortles. Assuming he is given a clean pocket (94.3 passer rating when kept clean vs 64.5 when pressured) and can once again limit turnovers, the Jaguars should have plenty of games play into their hands.